Enteric-coated Serrapeptase (phthalate-free): a powerful fibrinolytic enzyme. Bromelain: Proteolytic enzyme found in the pineapple plant; known for immune support. Papain: Derived from papaya; supports the body’s natural immune response. Lipase: Supports the breakdown of fats into essential fatty acids that are needed for healthy circulation. Amylase: Breaks down carbohydrates and starches into simple sugars. Rutin: Bioflavonoid that provides antioxidant support. Amla: Natural source of Vitamin C, supports regulatory immune response. Our enteric-coated serrapeptase has been formulated with the use of Methacrylic Acid Copolymer (MAAC), a safe food-grade compound used in the pharmaceutical industry with no reported side effects. Without enteric coating, enzymes will denature, or lose their effectiveness, in the stomach. In addition, various proteases in CoreZyme help break down proteins and amino acid chains, promoting total body support. 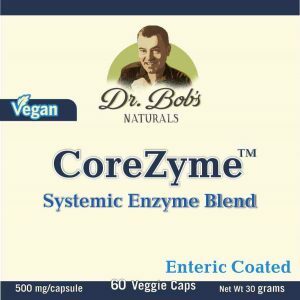 CoreZyme also supports healthy fibrin levels in the circulatory system. Fibrin is a protein that the body produces when healing. The protein precursor fibrinogen is converted into fibrin, which forms a layer of connective tissue inside the blood vessel. The fibrin strands assemble into a net-like structure over an affected vessel and harden, forming a “patch” to prevent further damage. While fibrin is meant to have a protective function in the body, too much fibrin buildup can cause problems. Our enzymes are manufactured in a ISO 9001:2000 and GMP certified facilities, and undergo rigorous quality testing. DOSAGE: Take on an empty stomach (30-60 minutes before or 2 hours after meals). Days 1-5: Take 1 capsule, 3 times a day. Days 6-11: Take 2 capsules, 3 times a day. Day 12+: Take the Therapeutic Dose of 3 capsules, 3 times a day. CoreZyme is free of pesticides, chemicals, preservatives, animal derivatives, dairy, yeast, fish or shellfish, peanuts, and tree nuts. All individual enzymes are kosher-certified ingredients, and suitable for vegetarians and vegans. 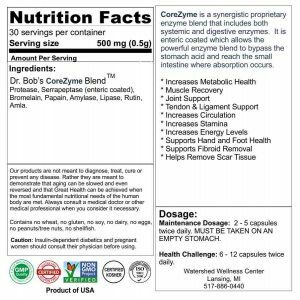 CoreZyme is manufactured in the USA and follows GMP guidelines.